Guys, It's Jazz Jackrabbit 2! Jack Jackrabbit 2 is his cousin! I find it funny that Emily confused Jazz with Reader Rabbit! One question, does Reader Rabbit also carry a big gun? I'm a bit disappointed that throughout all this talk about rabbit universes and cereal, NOT ONE MENTION OF THE TRIX RABBIT! Silly rabbit! I'm really digging the growing love for the Master System! In case you're wondering. The FM Sound Unit was originally an add-on for the console's original Japanese equivalent, the Sega Mark III. When it was redesigned as the Master System in Japan, the Yamaha YM2413 was built into the system. While the FM sound never made west, most games that support it will work with Western releases in conjunction with either a modded Master System or Stone Age Gamer's Power Base Mini FM for Genesis. The card slot on the Master System was made for budget games on Sega Cards and peripherals like the SegaScope 3-D glasses. When the Master System II was released (sans card slot), most of the card games were re-released on cartridge. I'm happy that Jazz 2 track made it in this episode! Hoping that more people are aware of that great game and maybe pester Epic Games on re-releasing them onto GOG or Steam, just get it back in circulation again! If Bubsy is able to come back, so can Jazz! Also, as the youngest child in my family, I can feel Nick's struggle! Great episode as always and hope to hear more great music and great tangents next week! Also, turns out K. Mixa also did the music to Sonic Blast on Game Gear, which is one of my favorite soundtracks on the system! The Texas Instruments SN76489A PSG chip used in the Master System has three square wave generators and one noise channel. Hey EB, is there a chance you could email us at insertcoin@thevgmjukebox.com? We wanted to contact you about something. Only if you're comfortable with that, though. Thanks! Sent an message just now! Hey, I'd be interested in helping out with that Sound of a Console poster, if anyone wants to collaborate. I sense another surge of submissions incoming! Shining Force CD! They're remakes of the first two Game Gear Shining Force games! Well it obviously wasn't the Super Famicom CD, but Shining Force CD didn't occur to me until after I hit "publish". I'll check it out; I've only heard a few tracks from SFCD and I don't remember them well. I'd love to do something like that, but that sort of design sensibility is far outside of my area of artistic expertise. Anyway, I really enjoyed that Jazz Jackrabbit 2 track. I've known about the game for a while but never played it or listened to the music. I was never really a PC gamer, so I always appreciate it when a patron requests something from a notable PC game/soundtrack I missed being a "Nintendo Kid." And man, that Coca Cola Kid track was great! I gotta listen to some more of that and Kojiro Mikusa's other work. Thanks goemonsama! 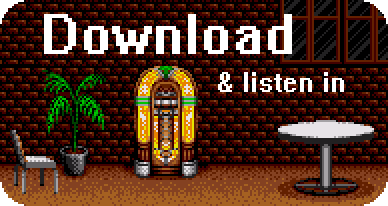 I'm glad I got to share some cool game music to people who have never heard them before! If I suggest another Kojiro Mikusa Game Gear soundtrack, may I recommend Sonic Blast? That one has some really good PSG tracks! I had Cobra Triangle as a young NES kid. Those levels where you had to save all the people would stress me out! I never finished the entire game. It was really hard! If I remember correctly, all of the level types repeat after you kill the sea dragon, so I believe I've seen most of what the game has to offer. It's a lot of fun, but man, that game is a tough one. Emily, in this episode you remarked about how nice the Patrons are. It’s true. That said, you and Josh need to accept that the reason they’re so awesome is precisely because with VGMJB, you two cultivated a culture of kindness. At every step of the way, you two have carried yourselves with an altruism that extends to every one of us. In so doing, you’ve both attracted listeners who genuinely care about other people, and given the rest of us an example of the best way to treat others online. A few episodes ago (in the distant past) when you were considering changing “You mean so much to us, and you always will” out of concern that it felt corny, we chimed in to express that wasn’t the case. Why? Because simply put, we all know it’s true. It’s not just kinda true, it’s the very DNA of the show. It never felt corny because it’s the verbal summation of every moment of VGMJB. That might sound like a cat poster, but it’s true.